It won’t be long before the strings are covered in vines. When people ask me about positive government action for urban nature, I always point to the Suginami ward’s giant green curtain. This massive screen of vines rises each summer on their eight story ward office next to the Minami Asagaya station on the Marunouchi subway line. 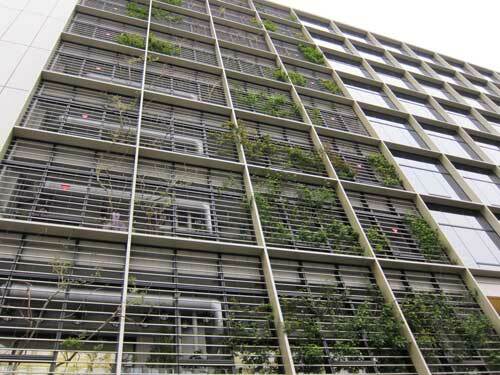 It has inspired local residents to create their own balcony green curtains, inserted a huge green space that occupies very little square footage on the ground, and demonstrated that their old office building can be energy saving, attractive, and full of life. Is dead corridor the opposite of green corridor? What are the effects of urban highways? Many landscape architects and urban biodiversity planners talk about the value of green corridors: places that provide wildlife shelter, that connect neighborhoods, integrate city and country, and mitigate the heat island effect. What should we call the multi-level roadways that are in many ways the opposite, that divide neighborhoods and reduce life? Dead corridors? I took this photo on Linus Yng’s architecture bike tour; I think it’s near Sasazuka. It’s very close to the lovely remnant of the Tamagawa josui (玉川上水). I think the image makes an interesting contrast with the serenity of the train photos from yesterday’s post. 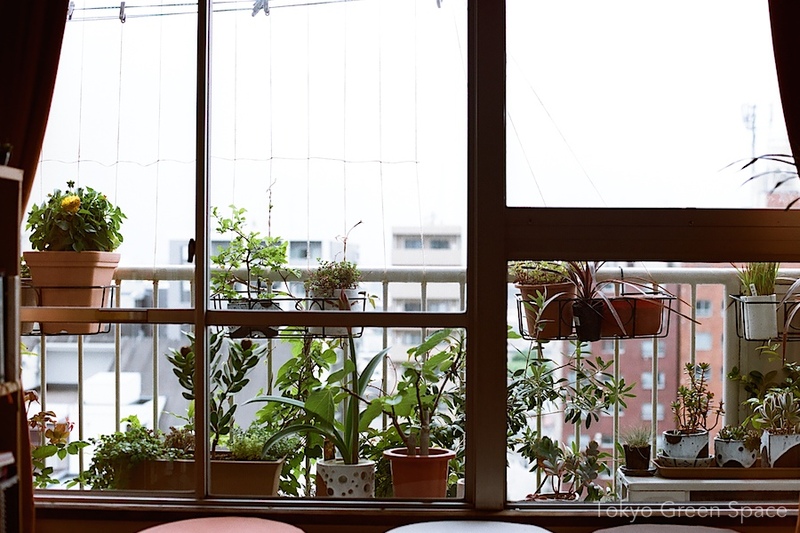 Tokyo Green Space focuses largely on how green space and plants make the city livable. Recent walks through Shibuya, Meguro, and Sasazuka made me realize anew the tremendous obstacles created by elevated freeways that cut through Tokyo. Above is the Shuto 4 expressway in Sasazuka, known as Koshu Kaido (甲州街道). There is a high speed expressway on top of an eight lane surface road. Crossing this mass of asphalt, traffic and emissions requires climbing a pedestrian overpass that goes between the levels. Below is the 246 expressway going west from Shibuya into Meguro. If I am not mistaken, there is an elevated freeway, a surface road, and a below grade highway as well. These massive structures are the opposite of the small lanes that make Tokyo feel so village-like and livable. There is some potential to “add” greenery to these structures. But I wonder why there isn’t more discussion in Tokyo, as there is in other world cities, about the potential for reclaiming these structures for non-automobile uses, through demolition or reuse as sky parks. Roppongi is a very foreign neighborhood for me since I rarely visit its offices, nightclubs and museums. However, with the recent conference, I took a friend along a back street between mega developments Mid Town and Roppongi Hills. We stumbled a very charming, small park named Roppongi West Park (六本木西公園). It was a welcome escape from the elevated freeways and concrete overload. The park provides a great amount of shade and the loud murmur of cicadas. My fellow Maryland state friend and I wondered how come mid-Atlantic cicadas only appear every seven years, while Japanese ones go through similar seven year cycles but appear annually. The park had benches with businessmen smoking, chatting, using their cellphones, and escaping their offices. There were also sand box, playground, and a public bathroom. Seeing this small gem made me think about the up-until-now unrealized possibilities for the mega developers to connect with their neighborhoods through landscapes. Mori Building talks about how its vertical gardens lower summer time temperature in its neighborhoods. And Mitsubishi Estate is concerned with making Marunouchi more attractive through livable streets. Creating gardens and habitats that extend to nearby pocket parks, as well as neighboring residential and commercial gardens, could brand these new places with historical memory, a signature fruit tree, butterfly or bird habitat, outdoor recreation, and innovative public place making. While the developers goal is to maximize rental income, attention to the neighborhood, its existing assets and people, could be a low-cost and high impact way to brand, differentiate, and attract visitors and tenants. District landscaping is one of the most economical and transformative improvements. By extending beyond the limits of a single property or the holdings of one developer, district landscaping is vital to place-making, memory, habitat, and human affection. 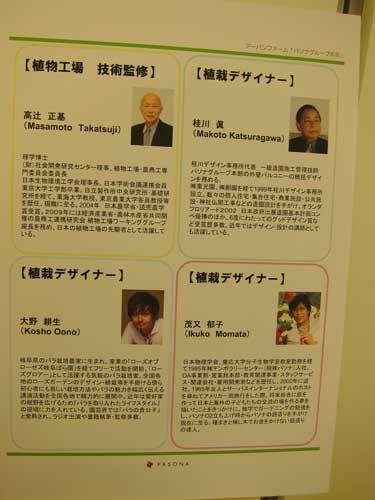 UPDATE: I posted a revised article, “Sensing Four Seasons at a Tokyo Office Building,” on Huffington Post on July 30, 2010. Some friends and I visited Pasona’s new office last week. 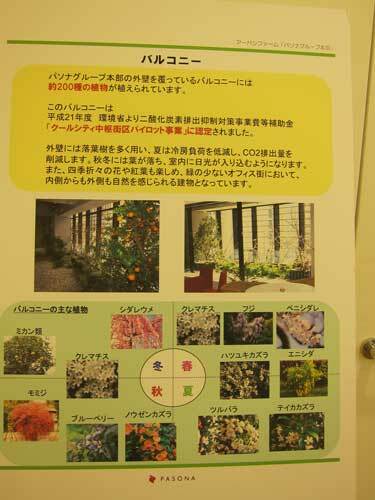 They are a large Japanese staffing farm that had a highly publicized basement farm in their old Otemachi headquarters. This year they moved nearby to Yaesu in their own newly built, nine story headquarters between Tokyo Station and Nihonbashi. Pasona has unveiled a much more elaborately landscaped interior and exterior. The image above is my favorite because it highlights the interface between the futuristic farm, dependent on a variety of grow lights including LEDs, and the urban environment outside. I am certain that the indoor vegetables will give them the most attention again, but actually I believe the exterior landscaping is more inspiring and impactful. Below is a brief tour of interior and exterior. After the photo tour, I will suggest some metrics for judging the success of this very visible corporate monument to urban nature. Glowing all the way across the wide downtown street even in daylight, a spectacular rice paddy with dozens of strong lights occupies the main lobby entrance of the building. The entrance doors are flanked on the outside by beautiful apple trees in giant rusted steel planters. 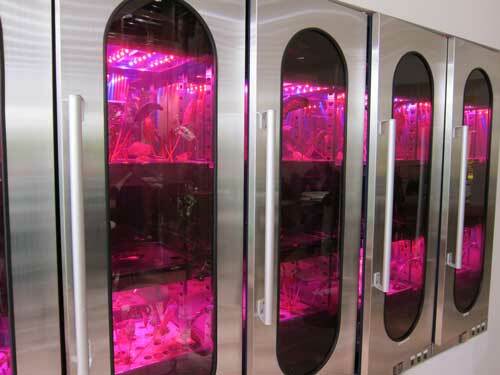 Almost the entire first floor of the building is devoted to the spectacle of vegetables planting, growing, and ripening under powerful grow lights: rice, tomatoes, melons, corn, eggplants, herbs, and lettuce. 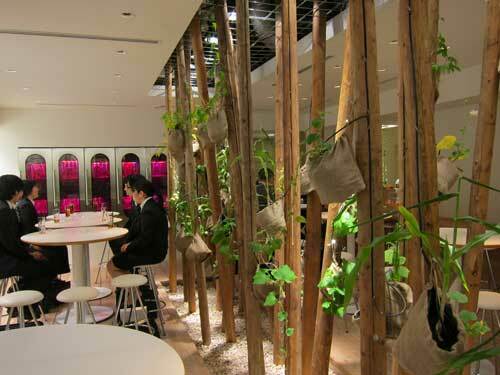 A large cafe features wood posts hung at angles and supporting canvas bags with soil and corn. One wall has a series of metal cases with purple lights and tiny fans that have a very “next century” feel. 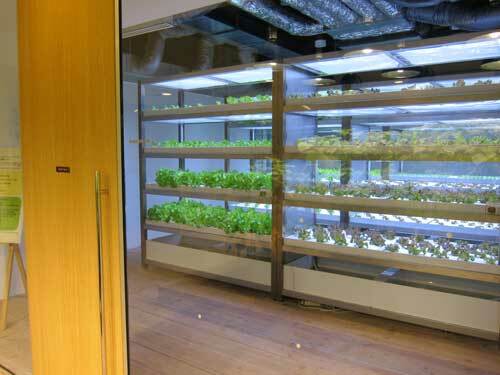 There is also a room with racks and racks of lettuce, and a field of giant sunflowers. 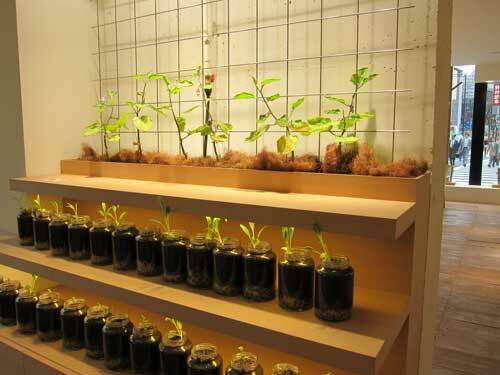 And everywhere vegetables and seedlings are arranged in attractive vignettes. Elsewhere, tomatos hang from the cut-outs in the ceiling. (Click to enlarge the photos below). Pasona demonstrates its commitment to bringing nature into the city by devoting so much valuable space and employing great landscapers and designers. Pasona packages its vision in a combination of high design and new technology that is visually stunning, unique and in many ways hopeful. It is interesting how the cafe and second story meeting spaces are divided and enhanced by greenery. The constant changing as plants plants grow and get replaced, and juxtaposing informal meeting spaces with living plants is a welcome change from most office interiors. But I also have to point out where the vision falls short. It largely fails as a public gathering place. The giant lobby rice paddy is at once open free to the public and oddly devoid of people, except for a few curious first time visitors. The strange color, strong heat, and loud sound of the lights seems to repel people. In fact, the employees use a side entrance, and bypass the lobby. There is no sense that employees or neighbors will use most of this space, except for suited young people using the cafe and second floor meeting rooms. The intensity of the lighting and sheer quantity beg the question of energy expenditure. Pasona must address how sustainable this idea of indoor agriculture is, and whether they see energy production or usage changing in the future of urban farming. There is no sense of season or natural habitat. It is understandable that birds and wildlife are not permitted inside, but their absence makes the interior seem sterile. Why is the corn ripening in May? While the indoor farm will generate the most attention for Pasona, I think that the exterior landscaping is more impressive and ultimately more interesting for urban habitat creation and the integration of nature with work space. Two thirds of the building front and at least one side have been carefully planted on handsome screened balconies to produce four seasons of color. Included are citrus trees, wisteria vines, Japanese maple, blueberries, and flowering vines like clematis. Although the plants are small now, it is easy to imagine the exterior becoming a unique vertical forest and colorful garden over the next years. The exterior vertical landscaping has 200 species of plants, and many trees that lose their leaves in the winter. The idea is that the plant mass will reduce carbon emissions, summer shade will keep the building cooler, and winter bare branches will allow more direct light during the cold season. While the public is not invited to the upper floors, it appears that the exterior plants are all on balconies that are either accessible or viewable from inside the offices. Click below to see posters that explain the exterior landscape and the designers who worked on this project, and how the exterior garden appears from the sidewalk below. I am looking forward to watching the exterior of the building grow into its potential. And I am eager to hear how the office workers feel about the outdoor plants that are so close to their interior work spaces. I’ll end this post with a dandelion weed I spotted on the edge of the rice field. It is this type of unplanned feature that makes natural landscapes so enchanting. 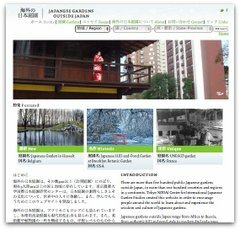 The Huffington Post published my article entitled “Biodiversity Remakes Tokyo.” I will become a regular blogger, so if you like the article please leave a comment on the Huffington Post, post it to your Facebook account, or Tweet it to your friends. Thank you! 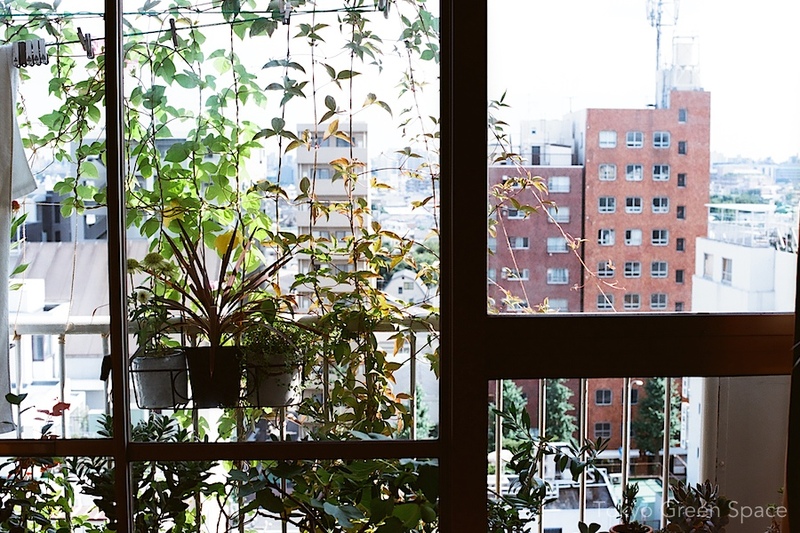 Ordinary gardeners and environmental visionaries in Tokyo, the world’s largest metropolis, are improving urban life for human and environmental benefit. While mainstream environmentalists work to save distant forests, urban innovators are creating new shared places that connect city residents to the environment and each other. Successful strategies include maximizing limited resources, engaging urban dwellers, and sharing daily life with plants and wildlife. Tokyo’s size, density, lack of open space, and past policy failures paradoxically make it a model for rebuilding mature cities and designing hundreds of new cities. Along with climate change, the world faces unprecedented urbanization, reaching 60% of the world population or 5 billion people by 2030. African and Asian urban populations will double between 2000 and 2030. Click to read the full story on the Huffington Post. Thanks to a great Japan eco-blog Kurashi, I learned about an Akihabara maids organization called Licolita that is involved in public environmental activities: including summer-time uchimizukko (splashing water on the sidewalk to lower ambient temperature), blessing bicycles at a shrine, and now growing and harvesting rice in rooftop pots. It is cool that this group is so focused on otakus (manga and anime fans) and raising their awareness and interest in urban ecology and agriculture. University summer break extends through the end of September. I was a bit shocked to see the Tokyo University of Agriculture laying down astro-turf on a playing field close to the center of campus. Some artificial grass defenders might say that it reduces the amount of pesticide and fertilizer, and is somehow more environmental. Still, I wonder if paving over a huge swath of land is really more environmental. What petrochemicals have gone into the manufacturing and installation of this “ever-green” turf? It seems doubly ironic at a leading agricultural university whose plant specialists should be researching and promoting playing field turfs that stand up to heavy use and do not require chemical pesticide and fertilizer. Given the TMG’s plans to install grass fields at primary and secondary schools, and the vast number of amateur and professional playing fields, focusing on the best natural turfs seems essential for biodiversity, storm run-off, energy independence, and heat island effect. Update: One Nodai professor told me that with the artificial turf there will be no fireworks accompanying the famous “daikon dance” this fall. Click the Youtube video below to see this proud and somewhat strange Ag U tradition! I am looking forward to attending a “daikon dance” event this fall. Another video featuring a strange mix of martial choreography, giant vegetables, and singer Koizumi Kyoko.